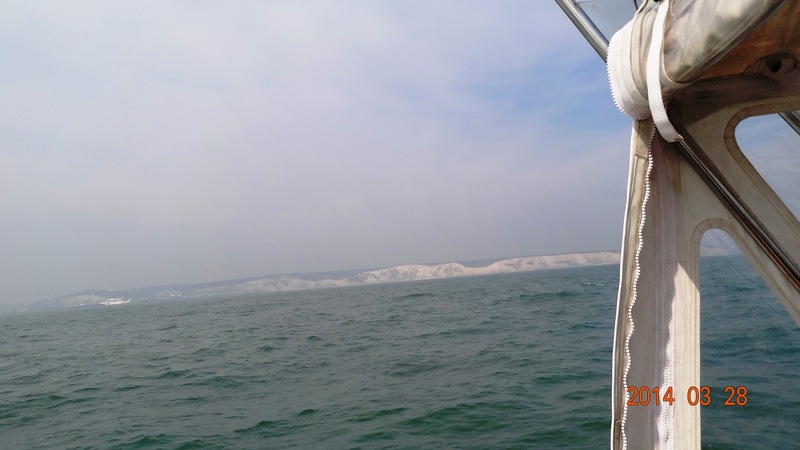 Having left Dover at 12.00 noon on Friday 28th March. We arrived in Calais at 4.00 pm. The crossing was trouble free and the boat behaved perfectly, in good weather conditions. I was very anxious about the crossing, taking to the open sea and crossing the English Channel was the most dangerous part of the whole Gap Year. At one stage, both the hand held GPS and navigation software stopped working so we had to revert to hand plotting on a paper marine chart, the old fashioned way! Luckily as a safety back up I had purchased a chart. We had to cross some of the busiest shipping lanes in the world. We actually only met 5 ships going south but there were lots of ferries crossing over and back between Dover and Calais. On arrival into Calais I called Port Control, who having checked our speed gave us permission to enter the port after a large car ferry. Another car ferry arrived in the outer channel and he changed his mind and asked us to wait. I misunderstood what he said and thought that he had told us to keep going and to follow the first car ferry but Neil and Michael thought he had said to wait until after the second. So I called him back for clarification. I thought he confirmed that we should keep coming so we did. (His English was better than my French but neither good enough!). Then the captain of the second ferry came on the radio saying that he thought the pleasure vessel (that’s us!) did not understand the instructions of the Port Controller( I secretly think the Captain had some sympathy for us as he sounded a perfect English gentleman and probably did not approve of the Controllers command of the English language). Port Controller then told us to proceed quickly into the harbour. We scurried in as quickly and as close to the entrance wall as possible. Suddenly we heard screams from above, looking up we could see there were a number of locals fishing off the harbour wall. Before we knew it we had caught three of their fishing lines. We slowed down to disengage them but next thing we had the Port Controller back on the radio telling us to hurry up. I had to make a captain decision and tell Neil to cut the fishing lines. We had three burly French men up on the wall screaming abuse at us. So on our arrival in Calais after a perfect departure from Dover and a great crossing we managed to annoy the Port Controller, a Ferry Captain and three fishermen. Ah C’est la Vie!! This entry was posted in C'est La Vie - The Boat, On the Journey and tagged Calais, Calais Port, Dover, Paper marine chart, Port Control, Port Controller. Bookmark the permalink. Omg that’s what I call stressful. My heart would be in my mouth! Good luck me hardies! Wow what a great feeling it must be to have crossed the Channel- now your adventure really begins! Bonne chance! Yes most dangerous bit over – now only 3350 kilometers to go to get to Berlin ! !